Three servings of dairy as part of a healthy, balanced diet will help contribute to your calcium needs for one day. However, dairy does not only contain calcium. Dairy products contain essential nutrients, ranging from vitamin A to zinc. Everyone in the family can benefit from dairy’s nutrients by consuming three dairy products every day. This will help make the diet nutrient-rich as dairy contains many nutrients. Research has shown that people who consumer dairy products daily have better nutrient intake. Dairy products also collectively supply four out of the seven nutrients that adults struggle to obtain daily. These include calcium, potassium, magnesium and vitamin A. Many product labels refer to “% NRV”, but what does this mean? The NRV (Nutrient Reference Value) is a guide to ensure that you take in the minimum amounts of nutrients you need every day in order to maintain a healthy body. Consuming 250ml milk + 200ml yoghurt + 40 g Cheddar cheese will contribute to 96% of your vitamin B12 needs for the day! Consuming 250ml milk + 200ml yoghurt + 40 g Cheddar cheese will contribute to 96% of your vitamin B12 needs for the day!For some nutrients, the RDA (Recommended Dietary Allowance) has been redefined and new values based on scientific data have been established. These are known as Dietary Reference Intakes (DRI). The NRV’s differ from the previous RDA’s as they include more nutrients (36 and energy values) and a range of levels for different purposes, and provide advice on reducing risk of chronic disease. The NRV, however, still include something known as the RDI (Recommended Dietary Intake). The RDI is the average daily intake level for a particular nutrient that is sufficient to meet the requirements of nearly all healthy people in a particular life stage. The table shows how consuming three dairy products every day, will significantly contribute to your daily requirements of nutrients needed every day. Everyone should aim for 3-A-DAY™, that is three servings of dairy a day, as part of a healthy, balanced diet. This will provide approximately 70% of the calcium needed daily. This makes 3-A-DAY™ dairy a very high source of calcium. Calcium is needed to build strong bones and teeth. Based on the Nutrient Reference Value (NRV), the minimum requirement of calcium for individuals 4 years and older is 1300mg per day. The NRV is a guide to ensure that you take in the minimum amounts of nutrients you need every day in order to maintain a healthy body. Research shows that mothers who eat at least three servings of dairy products every day are more likely to have children who are find of dairy. Almost all the calcium in your body is found in your bones, with only a little freely in the blood. But if the blood has too little calcium, it has to renew its stock and the obvious source in your bones. When this happens, bones weaken. As this process occurs daily, it is important to maintain bone mass and prevent bone loss by consuming enough calcium every day. Dairy products are a source of bio-available calcium, which is easily absorbed by the body in the presence of vitamin D.
· We need calcium for building and maintaining strong bones. 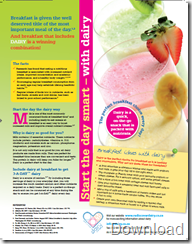 · Dairy products are a source of calcium in the diet. · Dairy calcium is particularly well absorbed and thus bioavailable. · To ensure optimal bone mass development, children need to consume enough calcium during the growth phase. Low bone mass is associated with a higher fracture risk – in children as well as in adults – and can lead to osteoporosis later on in life. · Dietary calcium enhances the effect of physical activity on bone mass during growth. Where do you get calcium from? 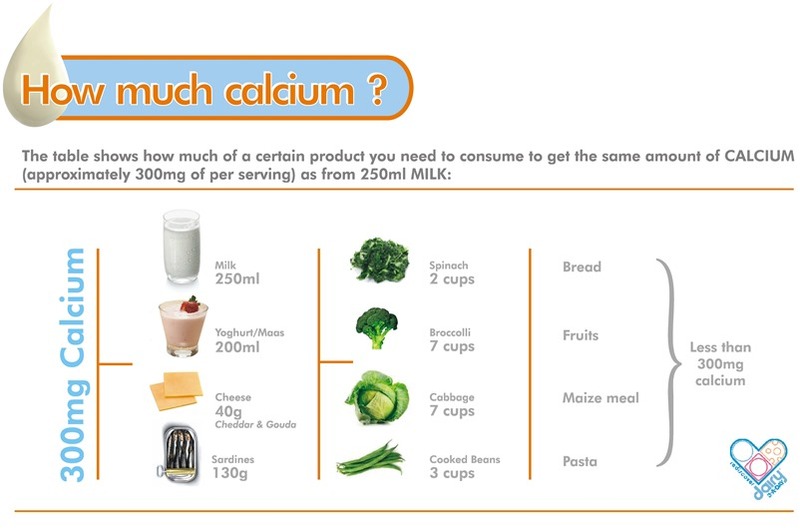 Dairy products such as milk, cheese, amasi and yoghurt are sources of calcium. Other sources of calcium include sardines, salmon, spinach, cabbage, broccoli and beans. · The human body contains about 1.2 kg calcium. · Your body absorbs only about a third of the calcium in dairy products, depending on your calcium status. It is therefore crucial to consume enough calcium daily and everyone can benefit from increasing their daily calcium intake. Calcium recommendations do, however, take into account natural losses and rates of absorption.